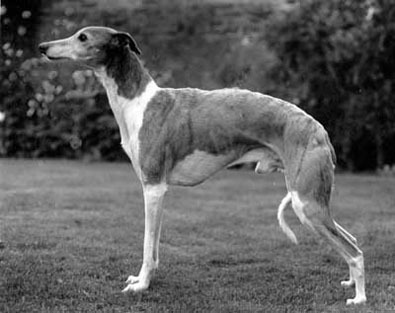 named in honour of his grandfather's three wins. 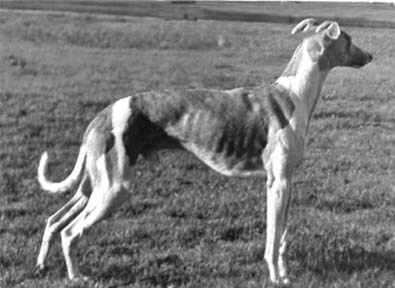 Flint performed a lot better on the coursing field than he did in the ring, winning or dividing all three puppy cups and also the Moonlake as well as other stakes, until a back injury, sustained hurdling the furniture at home, kept him off the field. 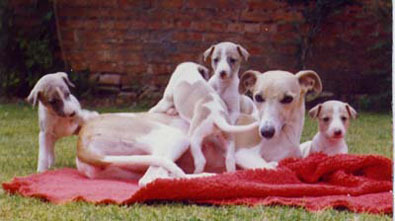 Sadly, Folly lost her second litter and I was lucky not to lose her as well. 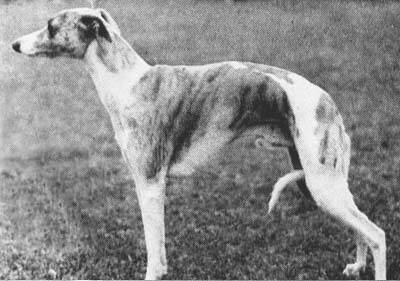 Going back to the Nimrodels for a puppy, I fell for the glamorous Precious, litter sister to Ch Peerless, heedless of Mary Lowe's warning that her line did not combine well with Lagunas. 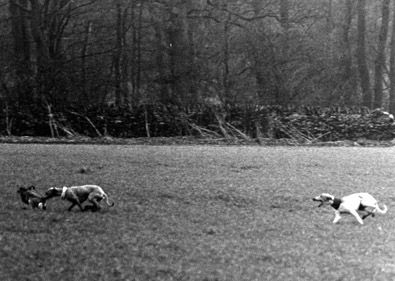 Flint was not a natural showman but he was a natural athlete. 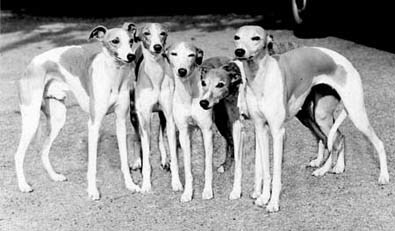 All four whippets kept pretty fit chasing squirrels in Kensington Gardens and it made them very quick on the turn, ideal training for coursing. 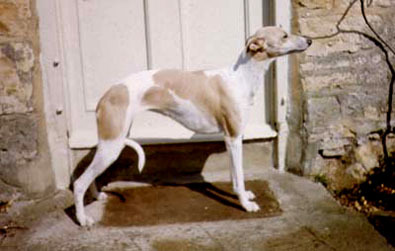 Training for shows did not come so easily but we persevered and Flint actually did quite well. 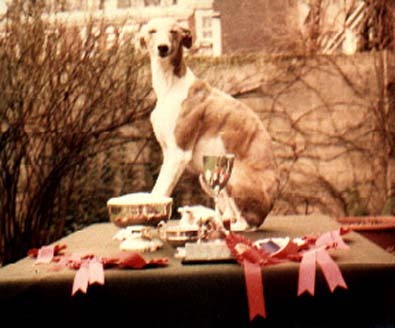 I still have the scruffy post card from the Kennel Club informing me of his stud book number. 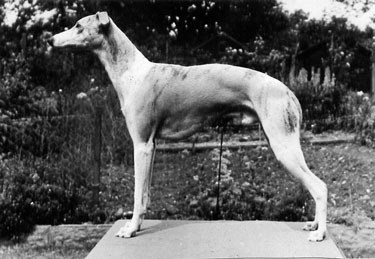 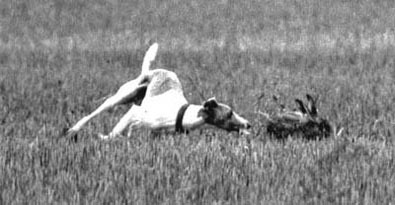 In the event, neither of Fable's litters, the first to Flint nor the second to Ch Chyton Copy-Press, produced show winners although they made their mark on the coursing field. 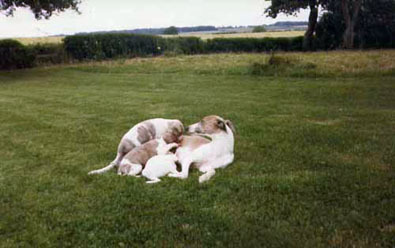 Folly (centre) with her grandchildren, Flight and Fancy and their parents, Flint and Fable. 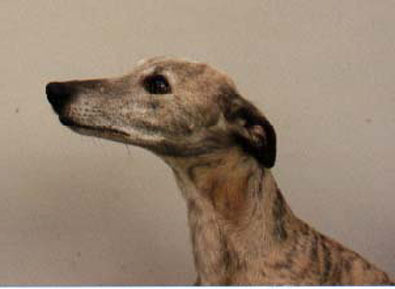 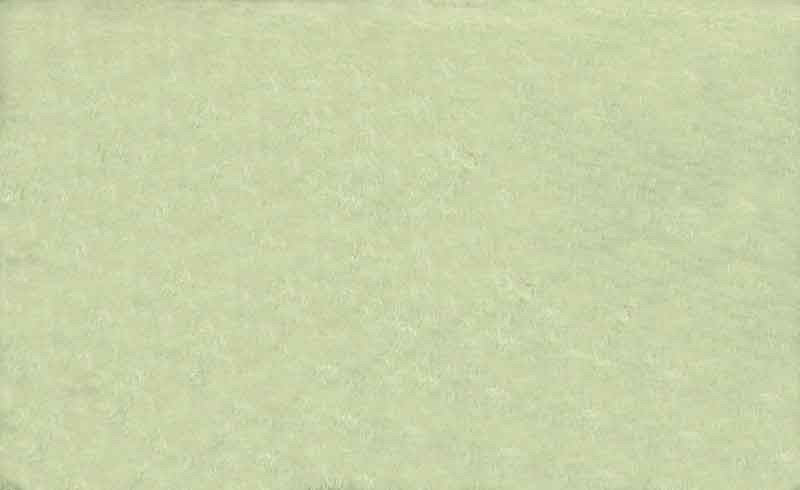 Fern (below) was born in 1988.